“Someday this war’s going to end,” laments Robert Duvall’s Col. Kilgore to conclude his memorable joyride through 1979’s Apocalypse Now. 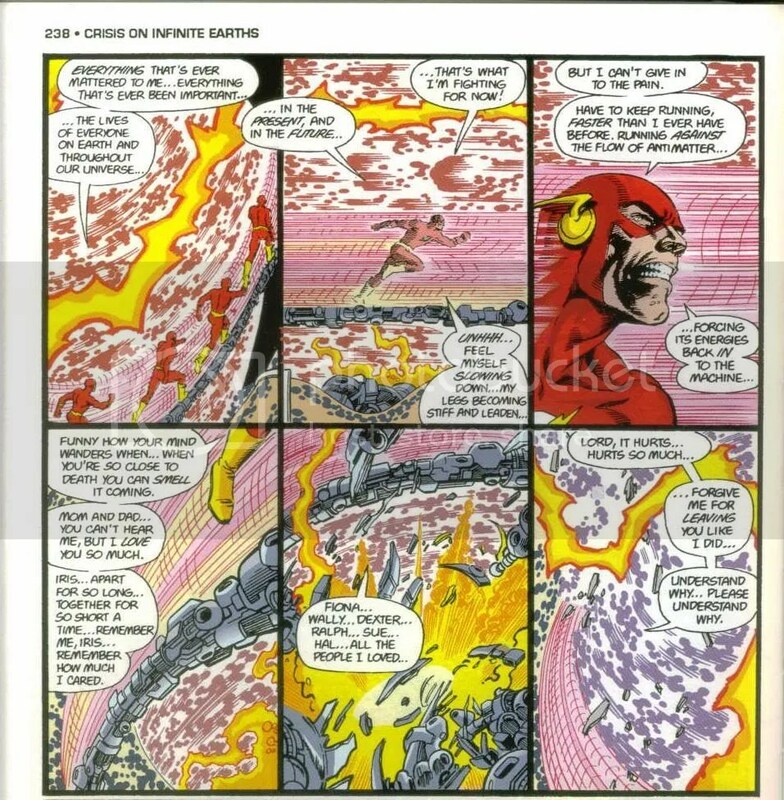 Similarly, as we come to the final issue of Crisis On Infinite Earths, I find myself longing (just a little) for more panels overstuffed with characters, more conversationally-expository dialogue, and even more stakes-raising plot twists. Still, Crisis had to end sometime. Last issue introduced the singular timeline and its history. It was the first step into an era that continues to inform DC’s superhero comics. As such, issue #12 — which appeared in comics shops some thirty years ago, during the first week of November 1985 — is about cleaning up the miniseries’ last bits of clutter and getting the merged timeline ready for all its prospective readers. It’s 42 pages of wall-to-wall action, executed skillfully by the creative team. 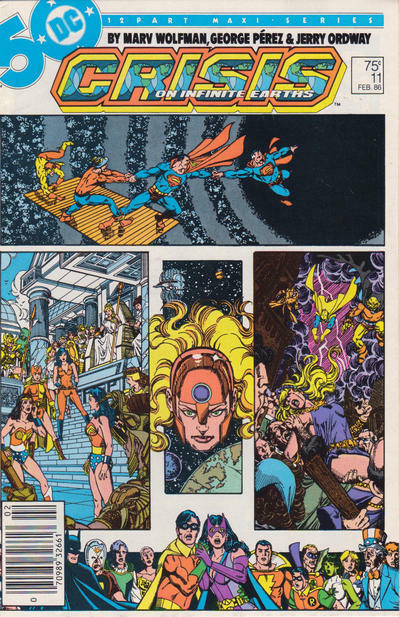 Speaking of which, credits: Crisis On Infinite Earths issue 12 was co-plotted, scripted, and edited by Marv Wolfman, co-plotted and pencilled by George Pérez, inked by Jerry Ordway (who also pencilled one page), colored by Tom Ziuko, and lettered by John Costanza. Robert Greenberger was the associate editor and Len Wein was the consulting editor. 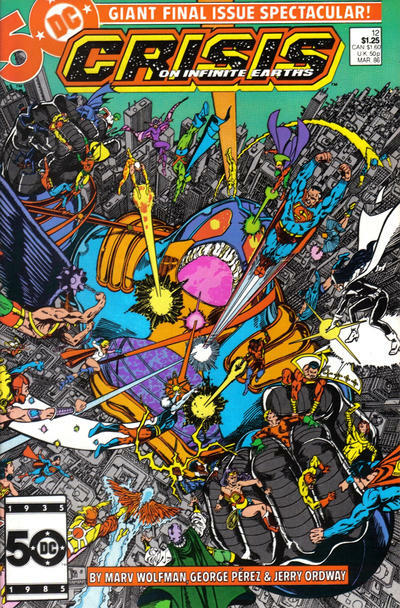 The issue follows a few basic tracks, including Earth invaded by shadow-demons and the final fight with the Anti-Monitor. However, it opens with the Forgotten Heroes, a group of (at the time) C- and D-listers: Animal Man, Adam Strange, Dolphin, Captain Comet, Rip Hunter, and the Atomic Knight. Last issue they came across Brainiac’s skull-ship, drifting listlessly through space; and this issue they see that Earth’s not where it should be. After Brainiac wakes up and is convinced that he needs to help save the universe (again), he realizes they need a more powerful ally — so naturally, he sets a course for Apokolips. Meanwhile, the Earth and Moon are still in the Anti-Matter Universe, with Anti-M’s giant heavenly holo-head talking smack. He recounts his efforts to “enlarge” the AMU and “have it replace all other universes,” only to be stymied by the Earth’s superheroes. Now, though, it’s time for the Earth to die, just like Supergirl, the Flash, and “so many others” died. Various reaction shots show stoic heroes, except for Kid Flash, who’s all “the Flash [really] is dead?” Clearly this is the next step in Kid Flash’s own subplot, but since it comes at the end of Anti-M’s speech (and isn’t followed up for several pages) it’s a little jarring. Anyway, as Harbinger summons various heroes and they start making plans, darkness covers the Earth. Super-senses allow the Earth-Two Superman to hear and see all of New York City descend into panic and chaos, and he gets a little rattled. As it turns out, the darkness is really the collective effect of millions of shadow demons, who (not two pages later) start swarming over the globe, picking off random civilians left and right. It’s portrayed very effectively. Wolfman’s narration uses phrases like “this place of death,” but he dials back the melodrama just enough to emphasize the creepiness of it all. Pérez and Ordway’s storytelling, combined with Ziuko’s colors, create a somber, spooky mood. Even a scene involving the ultra-bright Doctor Light contrasts the darkness with harsh yellows; and when the darkness “shatters” into shadow-demons, they spread out against a sickly pink sky. angry jeremiads about the utter stupidity and ineptness of the current DC brain trust vs. self-styled realists lecturing in acidic tones to why none of this matters in the long run unless you’re a big nerd that cares about stupid things. What’s missing is a cold dissection as to the why and how of this happening. ﻿Someday, possibly decades in the future, someone is going to ask Dan DiDio, Geoff Johns, Grant Morrison, and the rest of the DC brain-trust about what was really going on in the years 2004-2009. Until then, I will have to make do with my own perspective. To me, Final Crisis’ problems began with the success of 52 and the failure of “One Year Later.” Together, they were presented as a victory lap for Infinite Crisis, which advertised them via that trusty old device of the two-page characters-rushing-towards-the-reader spread. However, after 52‘s relatively good reception, I think DC’s high sheriffs figured that the marketplace was still more friendly to an event than to the regular books’ attempts to reconnect. 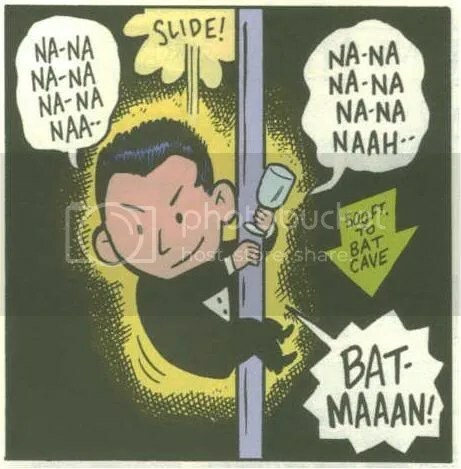 Furthermore, DC probably knew at the time that it had two big Grant Morrison projects in the pipeline, namely Final Crisis and “Batman R.I.P.” The seeds of each had already been planted in “Seven Soldiers,” Batman, and 52. However, I don’t think that DC had any blockbuster events planned between the end of 52 in May 2007 and the beginning of Final Crisis in May ’08; and in light of 52‘s success, I think DC wanted to gin up something to keep the momentum going. FC and “R.I.P.” might still have been big sellers on their own, but why take that chance? Give the public more 52 … or, more accurately, give it a “better” 52: a weekly series that helped out the regular titles and built momentum for FC. Thus, DC created Countdown, apparently without a lot of help from Morrison. (Remember all the plans for the last issue of Countdown? Morrison was going to write it, and then it was Morrison and Geoff Johns, and then it wasn’t the last issue of Countdown but a standalone issue which led into FC.) Whether Morrison’s involvement would have helped is probably moot by now, though. Countdown sold in decent numbers, despite receiving regular critical and fan drubbings. And I think that dichotomy helps explain Final Crisis’ big problem: it is an esoteric, creator-driven project which must fit into the every-Wednesday model of big-event series. I have nothing to back up either of the following assertions, but I suspect that for a good bit of the people who followed Countdown, FC doesn’t mesh with orthodox continuity strongly enough; or otherwise doesn’t feel enough like a big-event crossover. (Conversely, for many non-regular DC readers, FC may feel too heavily connected to Dan DiDio’s “culture of continuity.”) FC’s shipping schedule, and lack of connection to the regular titles, has also made it easy for every-Wednesday readers like me to forget it’s there. At this point FC might even feel perfunctory. Final Crisis might also have arrived “too late” in another way. In the wake of Countdown and “Sinestro Corps,” DC has settled on an array of mini-events emulating the latter, each focused on a different high-profile character. Indeed, six of the seven DC franchises I consider “foundational” — the Big Three, plus the Flash, Green Lantern, and the Legion — are either in the middle of an event or preparing for one; and Geoff Johns is involved in four of the six. (Justice League has just started relaunching the Milestone characters, but I don’t think that’s the same thing.) More importantly, though, none of these events ties directly into Final Crisis. That may be good in terms of continuity tangles, but it doesn’t help remind readers that FC is still out there, waiting to be resolved. I say all of this not sure myself of my feelings about Final Crisis’ merits. Each issue so far has left me with a feeling of creeping dread, which is probably the minimal, baseline reaction for which Morrison et al. were hoping. However, using a collection of moments to illustrate the end of the world, instead of a more traditional approach, takes some getting used to. I loved Morrison’s JLA, and I still think his DC One Million (which admittedly, at its core, was an extension of JLA) is a model for line-wide crossovers. FC’s storytelling style is a couple of steps removed from both of those, and again that might explain a reader’s ambivalence towards it. I don’t dislike FC, but neither is it as thrilling as certain other Morrison works. To sum up, then, I don’t think DC had much choice but to hype FC. It was the next big event after 52, but its ostensible lead-in may well have created an environment (at least among DC fans) more suited to smaller-scale “nothing will be the same” storylines. For some reason DC Universe #0 (written by Grant Morrison and Geoff Johns, drawn by committee) felt more Johnsian than Morrisonian. It struck me as a collection of preview pages from a half-dozen upcoming arcs, tied together by vague narration from a Certain Familiar Someone. I responded most favorably to the George Perez pages and the Final Crisis tease. The blow-up-the-base story currently running in Star Wars: Rebellion (#13 written by Jeremy Barlow, drawn by Colin Wilson) is starting to feel padded by about an issue, and this is that issue. Most of it follows a Rebel soldier as she tries to escape a sadistic Imperial officer and the requisite stormtrooper squads. There’s some narration about her coming to grips with the meaning of being a Rebel, but that was lost on me somewhat because I’ve never gotten too invested in this character. A promising sequence at the end makes a good case for our heroine blowing up half the base with a single grenade (not unprecedented in Star Wars, I think you’ll agree). Overall, some good stuff, and my opinion may change after next issue, but for now it still seems a bit long. Teen Titans Year One #4 (written by Amy Wolfram, pencilled by Karl Kerschl, inked by Serge LaPointe) is, as the cover indicates, a Kid Flash spotlight, but it continues the Batman/Robin storyline which has run through the book so far. The issue doesn’t quite put Flasher in the “I should be the leader” slot, but it does give him an ego to go with his considerable powers. Wolfram and Kerschl root for him regardless, so that he’s never really unsympathetic. Also, Aqualad gets more of a personality, although he still doesn’t do a whole lot. Wolfram and Kerschl’s simple storytelling comes across as very matter-of-fact, and it leaves room for Kerschl’s stylized, expressive designs to work. I’m looking forward to the rest of the series and wishing it could go on longer. Back in the current Teen Titans (#58 written by Sean McKeever, pencilled by Carlos Rodriguez, and inked by various people), this month Miss Martian must fight not only the Terror Titans, but also her evil conscience. (I’ve been reading too many solicitations.) Not knowing much about the character, I thought this was a good way to highlight her inner turmoil. I was a little confused at first, thinking that her Evil Self was somehow connected to her Evil Future Self from a few issues back, but that was cleared up soon enough. The art was decent: not too far from the book’s normal style, not too flashy, but adequate for the job at hand. I get the feeling I should like “Secret Origin,” part 2 of which appears in Green Lantern #30 (written by Geoff Johns, pencilled by Ivan Reis, inked by Oclair Albert), but it keeps falling flat for me. I shouldn’t fault it for changing Hal’s origin so that only he (and not the little training capsule) is yanked out of the hangar by Abin Sur’s ring. Working classic GL characters into the background is also acceptable, as is tying it into “The Blackest Night” and the Ysmault prophecies. Maybe I just have a problem with Ivan Reis drawing Hal to look 17 years old; or with Johns having Hal cause a rival to crash. Otherwise, “Secret Origin” is appropriately reverent, which is nice. I don’t dislike this storyline, but I like it less than Johns’ and Reis’ other GL work. Johns does better with Action Comics #864 (pencilled by Joe Prado, inked by Jon Sibal), a bridge between Countdown and Legion of Three Worlds which plays like a standalone murder mystery. Basically, Batman and Lightning Lad (of the “Earth-1 Legion”) clash over the corpses of Karate Kid and Una. Batman also makes the point that he’s met three different versions of the Legion, so naturally he’s not inclined to trust any of them. The mystery isn’t solved — it’s a teaser for the aforementioned LO3W, after all — but the issue is tied together by a Mysterious Narrator revealed on the last page. Suspenseful! (Also, this week, redundant!) The art is okay — a little too chunky, but not to the point of Liefeldism. I can’t get used to a Grunge-like Lightning Lad, though. Single-handedly and anonymously, the Flash saves the Multiverse’s five remaining Earths. After this point Barry starts jumping around in time, interacting with Kid Flash, the Joker, and Batman, so it’s not really a soliloquy anymore. Also, I wasn’t in a mood to dwell on Barry’s death. It’s enough to say that I think this scene holds up as a fine sendoff to the character who introduced DC to its Multiverse. 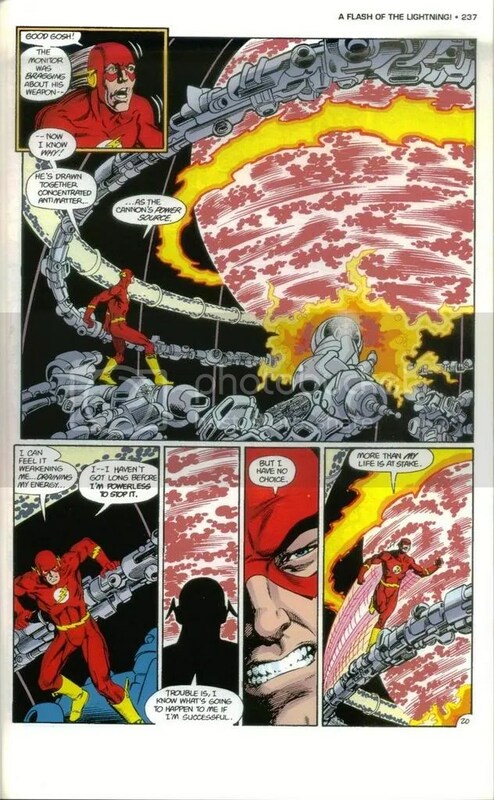 Barry’s monologue is one of the few instances in superhero comics where, “realistically,” a character would talk to himself as he literally ran out his life.